The weather was beautiful and it was a great day for golf!! We had 19 teams play in the tournament and lots of great help from our Blue Valley Lutheran Homes Foundation members and staff. We appreciated all of the help and support from our sponsors for the tournament to raise funds for a handicap accessible golf cart. 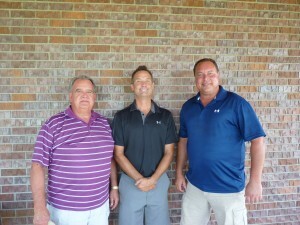 Congratulations to the winners of the Blue Valley Lutheran Homes Golf Tournament! Championship Flight Winners are Hayden’s Truck Shop with 15 under. 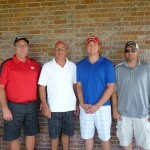 Team members are Brandon Priefert, Randy Mesloh, Lance Smith and Ross Barnes. Team members include Tim Benson, Kari Benson, Shelly Pulliam, and Quenton Pulliam. 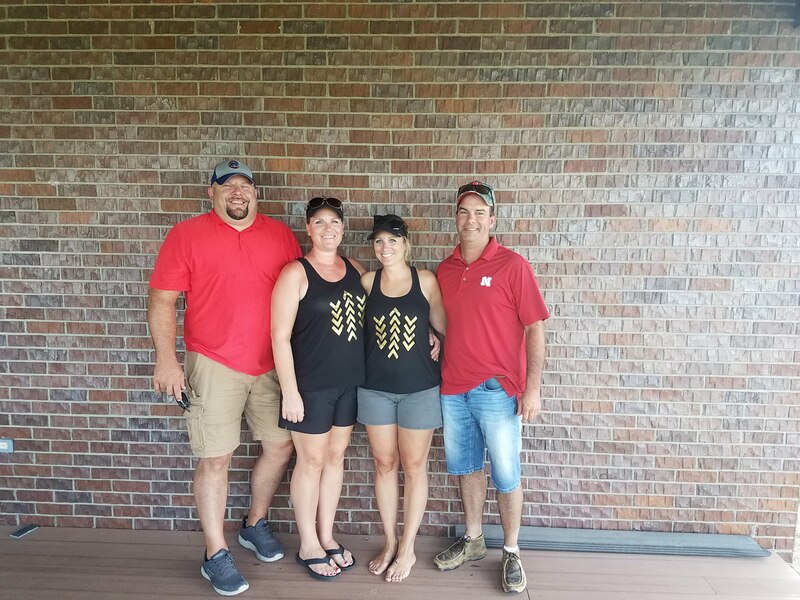 Team Members include Leisa Bohling, Matt Bohling, Jill Schroeder, and Scott Schroeder. 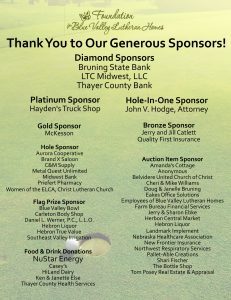 Thank You Golf Tournament Sponsors and Donors! 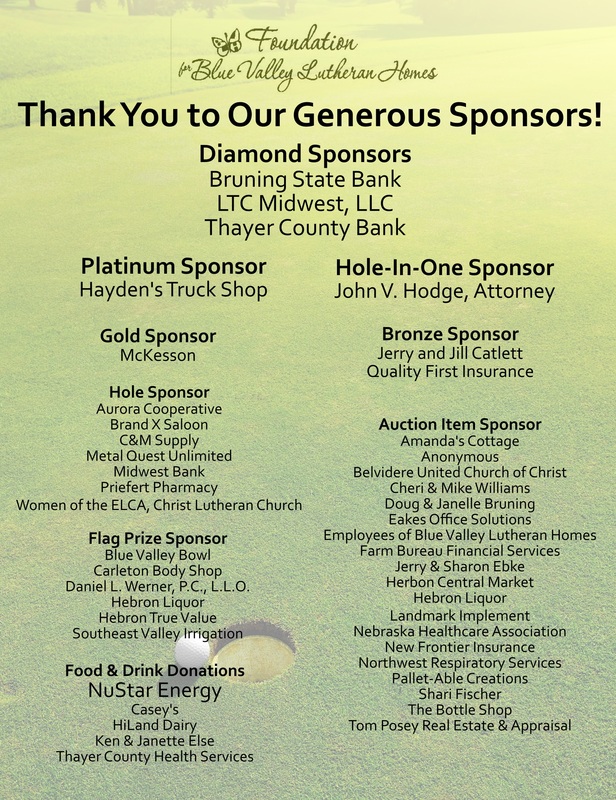 A special thank you to all of our golf tournament sponsors and donors! Daniel L. Werner, P.C., L.L.O. Posted in Events, Foundation | Comments Off on Thank You Golf Tournament Sponsors and Donors! On August 18th, 2017, the Foundation for Blue Valley Lutheran Homes (BVLH) in Hebron, NE will be hosting its 13th Annual Golf Tournament at the Hebron Country Club. BVLH is a non-profit long-term care campus that serves several different populations: individuals needing rehabilitation services, the developmentally disabled, those with Alzheimer’s, individuals needing short or long-term nursing care or those ready for a little extra help in Assisted Living. The Foundation and their fundraising efforts make it possible for our residents and staff to enjoy the “extras” beyond the basics that daily operation funds provide. Some of our residents don’t have family or friends who provide for them so the work of the Foundation is vital for their care and comfort. Fees are $240 for a four person team, which includes coffee and rolls, boxed lunch and a grilled burger meal for supper. Team check-in begins at 8:00 am and teams will tee-off at 9:00 am. Space is limited to 24 teams, so early payment of your entry fee will secure your team’s participation. Entry forms are due by August 4th. Click here to get an entry and sponsorship form! Have or Sponsor a Team – We are accepting only 24 teams, so register early! 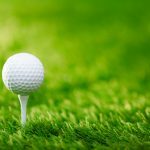 Tournament Sponsors – All tournament sponsors will be listed on printed materials and we’ll post your business on our website as a 2017 Golf Tournament Sponsor (www.bvlh.org). There are various levels of sponsorship, see the entry form for more details. Tournament Gift Bag Items – Each golfer gets a favor bag. Gifts can be golf balls, tees, koozies, mugs, towels, hats, notepads, pens, etc. It’s a great way to advertise your business! Food & Drink Donations – It’s as simple as providing water, sport drinks, juice bottles, items for grab-and-go breakfast or boxed lunch. Our 2017 proceeds will be used to purchase a handicap accessible golf cart to assist in transporting residents to appointments as well as to get residents out of the facilities and into the community. 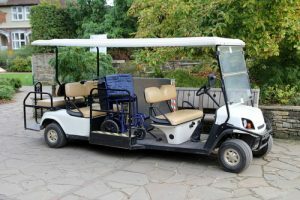 The golf cart will allow residents to see sights around town, give residents the opportunity to get additional sunshine and fresh air as well as provide a safe and easy method of transport to and from appointments. Please help us make significant strides toward this year’s goal! If you have any questions or need additional information, please contact us. We thank you for your past support of BVLH and appreciate all the ways you continue to support us – through donations, volunteerism, or prayers. The Foundation for Blue Valley Lutheran Homes is hosting a Chicken BBQ Dinner at the Thayer County Fair. Meal tickets are $10 and available at the fair. All proceeds go to the Foundation for Blue Valley Lutheran Homes. The Dinner will be held under the Grandstands. Dinner includes half a chicken, baked beans, a roll, chips and a drink. Find more information about the Thayer County Fair here. On August 18, 2017, the Foundation for Blue Valley Lutheran Homes (BVLH), in Hebron, NE, will be hosting its 13th Annual Golf Tournament at the Hebron Country Club. More details will follow! Team check-in begins at 8:00 am and teams will tee-off at 9:00 am. Space is limited to 24 teams, so start planning early! Create or Sponsor a Team – We are accepting only 24 teams, so register early! 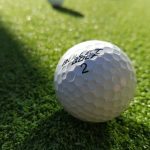 Tournament Sponsors – All tournament sponsors will be listed on printed materials and we’ll post your business on our website as a 2017 Golf Tournament Sponsor (www.blvh.org). More details to come about this. 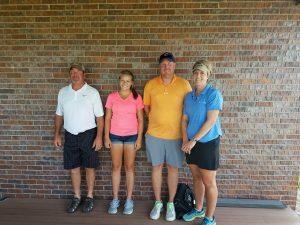 The 12th Annual Foundation for Blue Valley Lutheran Homes Golf Tournament was held August 19 at the Hebron Country Club in Hebron, Nebraska. With a beautiful day and 72 golfers, the Tournament was a success; raising more than $7,000. 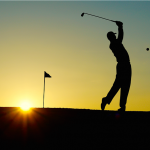 The Foundation for Blue Valley Lutheran Homes Golf Tournament began in 2004, as a way to raise funds for remodeling and upgrade projects that normal operating expenses do not cover. This year’s funds are earmarked for a shower chair for residents in the Care Home. The shower chair allows dependent residents to have their showers and cares done in a safe and easily managed method. The chair helps make the tasks easier, safer and puts less stress on the residents and staff. The chair aids in protecting skin integrity all while keeping residents clean and comfortable. A beautifully sunny day with very little breeze set the stage for a wonderful day with golfers enjoying the scramble competition, food and beverages, flag prizes, and a great golf experience. The threat of impending rain kept the golfers busy on the course to try and finish before the rain hit. Golf teams came from Hebron, Ruskin, Bruning, Deshler, Davenport, Lincoln, Omaha and surrounding areas to participate in a day of relaxation and golf. 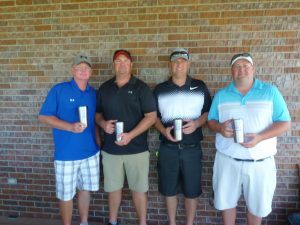 The tournament champion this year was the Gunner Mumford, Dave Klaumann, Ryan Butler and Eric Krupicka team with a score of 55. 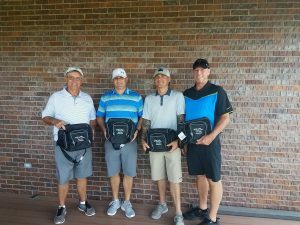 The first flight winners were the Draeger McDonald team with members Brandon Draeger, Damon McDonald, Matt Vieselmeyer and Brian Yeager with a score of 63. The second flight winner went to the Blue Valley Lutheran Homes team with members Janice Klaumann, Dale Klaumann, Eldon Kassebaum and Randy Kozeal with a score of 72. Each flight winner was awarded a commemorative cooler. Congratulations also goes out to Dave Klaumann who got a Hole in One on Hole #4. That was a special addition to a very fun day! A wonderful hamburger, polish dog, potato salad, baked beans, cookies and ice tea supper was donated and cooked by NuStar Energy of Geneva, Nebraska. 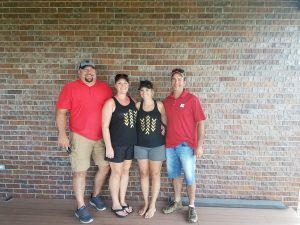 On August 19, 2016, the Foundation for Blue Valley Lutheran Homes (BVLH), in Hebron, NE, will be hosting its 12th Annual Golf Tournament at the Hebron Country Club. 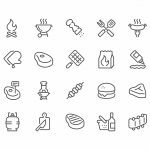 Fees are $240 for a four person team, which includes coffee and rolls, boxed lunch and a grilled burger meal for supper. Team check-in begins at 8:00 am and teams will tee-off at 9:00 am. Space is limited to 24 teams, so early payment of your entry fee will secure your team’s participation. Entry forms are due by August 5th. Tournament Sponsors – All tournament sponsors will be listed on printed materials and we’ll post your business on our website as a 2016 Golf Tournament Sponsor (www.blvh.org). There are various levels of sponsorship, see the entry form form more details. Tournament Gift Bags – Each golfer gets a favor bag. Gifts can be golf balls, tees, koozies, mugs, towels, hats, notepads, pens, etc. It’s a great way to advertise your business! Our 2016, proceeds will be used to purchase a shower chair for the Care Home. The shower chair allows dependent residents to have their showers and cares done in a safe and easily managed method. The chair helps make the tasks easier, safer, and puts less stress on the residents and staff. The chair can be used to keep track of weights, assist in protecting skin integrity (less risk of developing sores or open areas) all while keeping residents clean and comfortable. 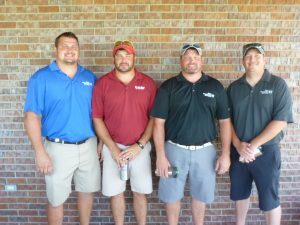 The 11th Annual Foundation for Blue Valley Lutheran Homes Golf Tournament was held August 21 at the Hebron Country Club in Hebron, Nebraska. With a beautiful day and 95 golfers, the Tournament was a huge success; raising more than $12,000. The Foundation for Blue Valley Lutheran Homes Golf Tournament began in 2004, as a way to raise funds for remodeling and upgrade projects that normal operating expenses do not cover. This year’s funds are earmarked for The Gardens. The funds will be used to add a driveway to The Gardens entrance making it easier for residents to leave for appointments or for family and friends to come and visit their loved ones. A beautifully sunny day with a strong breeze set the stage for a wonderful day with golfers enjoying the scramble competition, food and beverages, flag prizes, and a great golf experience. Golf teams came from Hebron, Ruskin, Bruning, Deshler, Davenport, Lincoln, Omaha and surrounding areas to participate in a day of relaxation and golf. 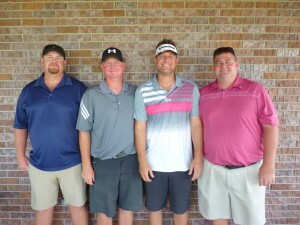 The tournament champion this year was the Eric Krupicka team with a score of 55. 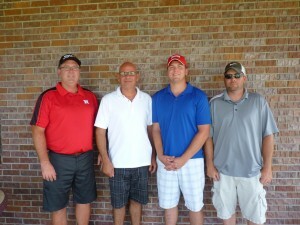 The first flight winners were the team from Capital Sanitary/ LTC Midwest, with a score of 62. 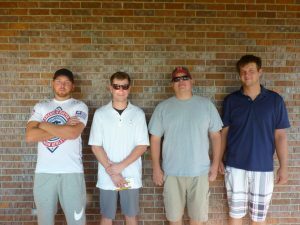 The second flight winner went to the Crop Production Services team with a score of 67. 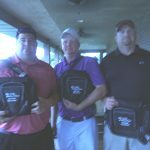 Each flight winner was awarded a commemorative cooler. A wonderful hamburger and polish dog supper was donated and cooked by NuStar Energy of Geneva, Nebraska.